Maharaj: The perceiver of the world, is he prior to the world, or does he come into being along with the world? Questioner: What a strange question! Why do you ask such questions? M: Unless you know the correct answer, you will not find peace. M: God is only an idea in your mind. The fact is you. The only thing you know for sure is: ‘here and now I am’. Remove, the ‘here and now’ the ‘I am’ remains, unassailable. The word exists in memory, memory comes into consciousness; consciousness exists in awareness and awareness is the reflection of the light on the waters of existence. 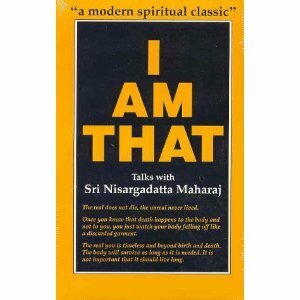 Q: Still I do not see how can the world be in me when the opposite ‘I am in the world’ is so obvious. M: Even to say ‘I am the world, the world is me’, is a sign of ignorance. But when I keep in mind and confirm in life my identity with the world, a power arises in me which destroys the ignorance, burns it up completely. Q: Is the witness of ignorance separate from ignorance? Is not to say: ‘I am ignorant’ a part of ignorance? M: Of course. All I can say truly is: ‘I am’, all else is inference. But the inference has become a habit. Destroy all habits of thinking and seeing. The sense ‘I am’ is the manifestation of a deeper cause, which you may call self, God, reality or by any other name. The ‘I am’ is in the world; but it is the key which can open the door out of the world. The moon dancing on the water is seen in the water, but it is caused by the moon in the sky and not by the water. Q: Still the main point seems to escape me. l can admit that the world in which I live and move and have my being is of my own creation, a projection of myself, of my imagination, on the unknown world, the world as it is, the world of ‘absolute matter’, whatever this matter may be. The world of my own creation may be quite unlike the ultimate, the real world, just like the cinema screen is quite unlike the pictures projected onto it. Nevertheless, this absolute world exists, quite independent of myself. Q: Is there no contradiction in terms? How can independence prove identity? M: Examine the motion of change and you will see. What can change while you do not change, can be said to be independent of you. But what is changeless must be one with whatever else is changeless. For, duality implies interaction and interaction meats change. In other words, the absolutely material and the absolutely spiritual, the totally objective and the totally subjective are identical, both in substance and essence. M: Assert your independence in thought and action. After all, all hangs on your faith in yourself, on the conviction that what you see and hear, think and feel is real. Why not question your faith? No doubt, this world is painted by you on the screen of consciousness and is entirely your own private world. Only your sense ‘I am’, though in the world, is not of the world. By no effort of logic or imagination can you change the ‘I am’ into ‘I am not’. In the very denial of your being you assert it. Once you realise that the world is your own projection, you are free of it. You need not free yourself of a world that does not exist, except in your own imagination! However is the picture, beautiful or ugly, you are painting it and you are not bound by it. realise that there is nobody to force it on you, that it is due to the habit of taking the imaginary to be real. See the Imaginary as imaginary and be free of fear. Just as the colours in this carpet are brought out by light but light is not the colour, so is the world caused by you but you are not the world. That which creates and sustains the world, you may call it God or providence, but ultimately you are the proof that God exists, not the other way round. For, before any question about God can be put, you must be there to put it. Q: God is an experience in time, but the experiencer is timeless. M: Even the experiencer is secondary. Primary is the infinite expanse of consciousness, the eternal possibility, the immeasurable potential of all that was, is, and will be. When you look at anything, it is the ultimate you see, but you imagine that you see a cloud or a tree. Even the sense of ‘I am’ is composed of the pure light and the sense of being. The ‘I’ is there even without the ‘am’. So is the pure light there whether you say ‘I’ or not. Become aware of that pure light and you will never lose it. The beingness in being, the awareness in consciousness, the interest in every experience — that is not describable, yet perfectly accessible, for there is nothing else. Q: You talk of reality directly — as the all-pervading, ever-present, eternal, all-knowing, all-energizing first cause. There are other teachers, who refuse to discuss reality at all. They say reality is beyond the mind while all discussions are within the realm of the mind, which is the home of the unreal. Their approach is negative; they pinpoint the unreal and thus go beyond it into the real. M: The difference lies in the words only. After all, when l talk of the real, I describe it as not-unreal, space-less, time-less, cause-less, beginning-less and end-less. It comes to the same. As long as it leads to enlightenment, what does the wording matter? Does it matter whether you pull the cart or push it, as long as it is kept rolling? You may feel attracted to reality at one time and repelled from the false at another; these are only moods which alternate; both are needed for perfect freedom. You may go one way or another — but each time it will be the right way at the moment; just go whole-heartedly, don’t waste time on doubting or hesitating. Many kinds of food are needed to make the child grow, but the act of eating is the same. Theoretically — all approaches are good. In practice, and at a given moment, you proceed by one road only. Sooner or later you are bound to discover that if you really want to find, you must dig at one place only — within. Neither your body nor mind can give you what you seek — the being and knowing your self and the great peace that comes with it. Of all the affections the love of oneself comes first. Your love of the world is the reflection of your love of yourself, for your world is of your own creation. Light and love are impersonal, but they are reflected in your mind as knowing and wishing oneself well. We are always friendly towards ourselves, but not always wise. A Yogi is a man whose goodwill is allied to wisdom. You can download a PDF of the entire book here.